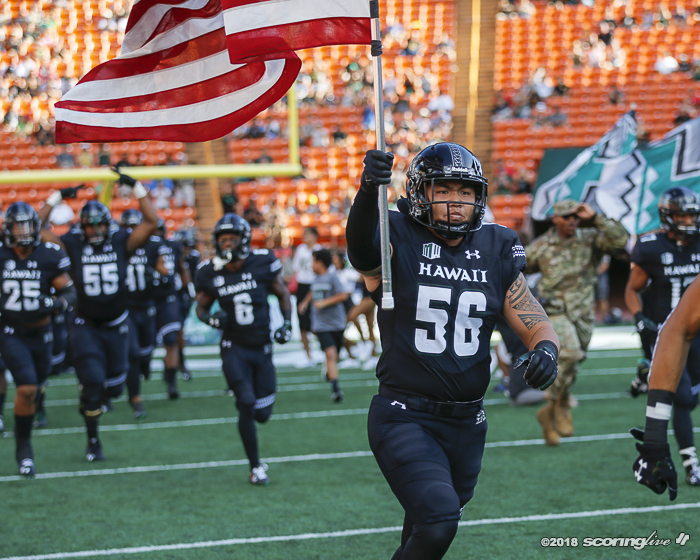 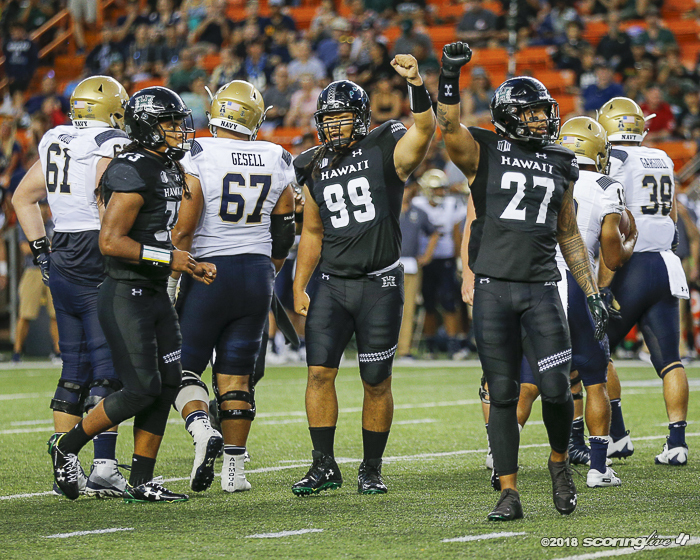 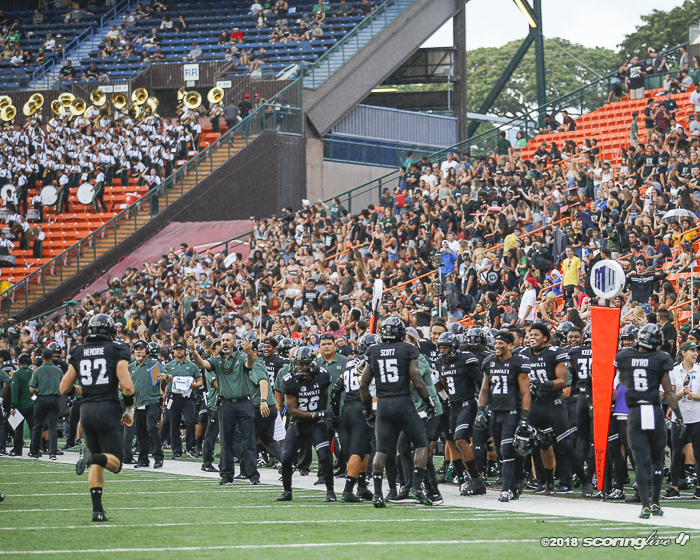 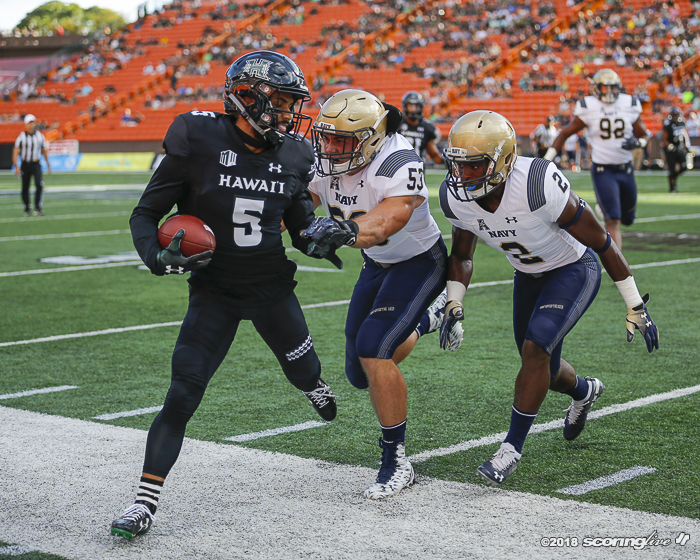 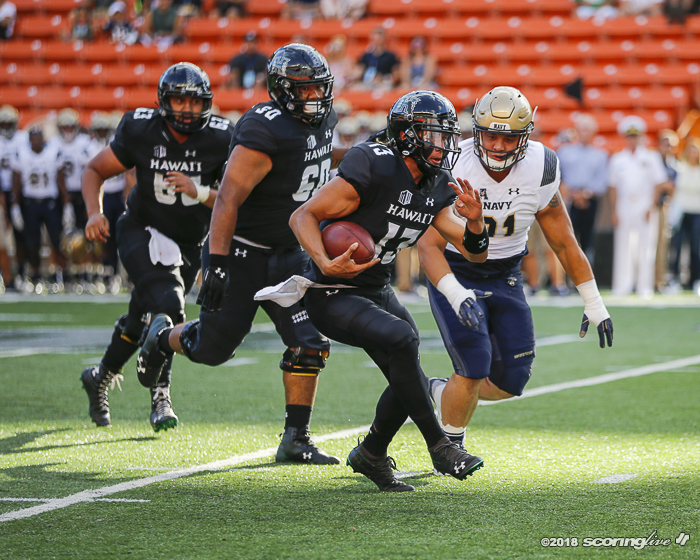 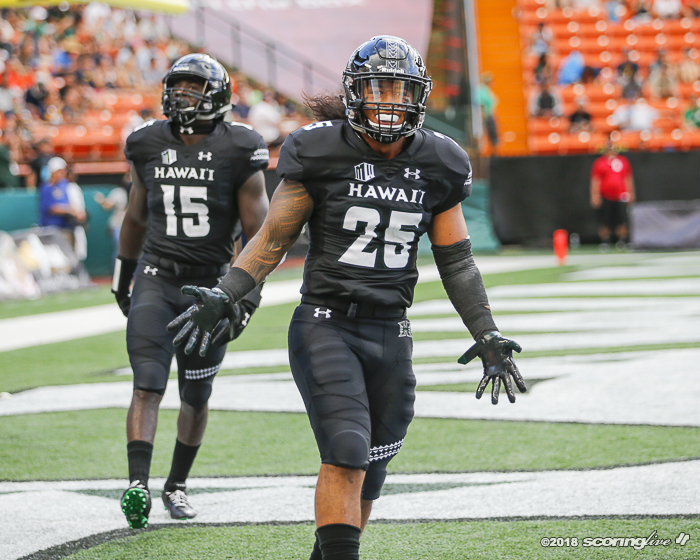 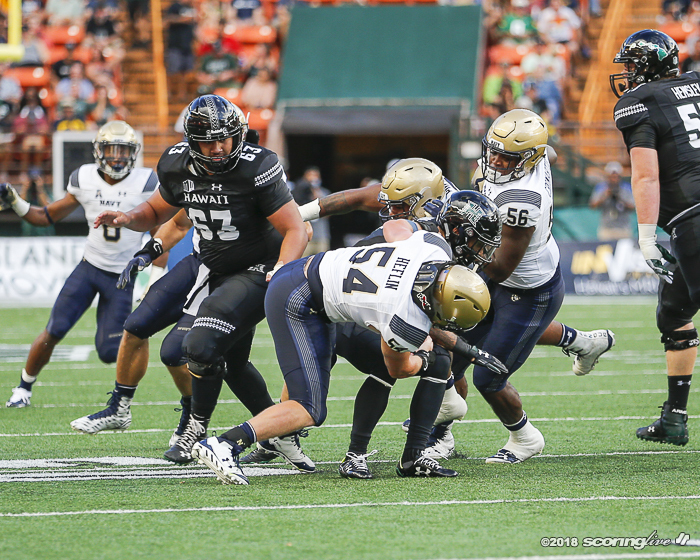 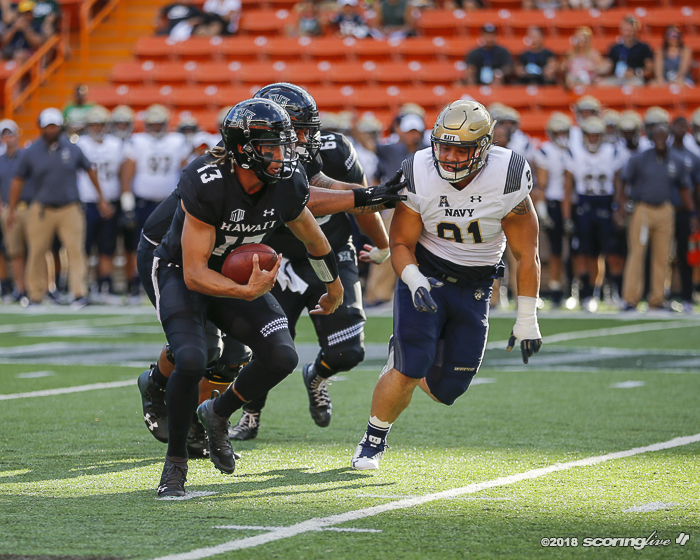 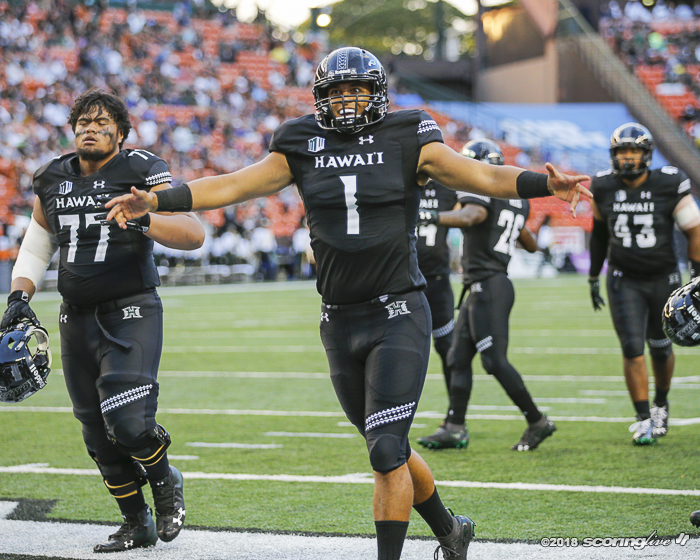 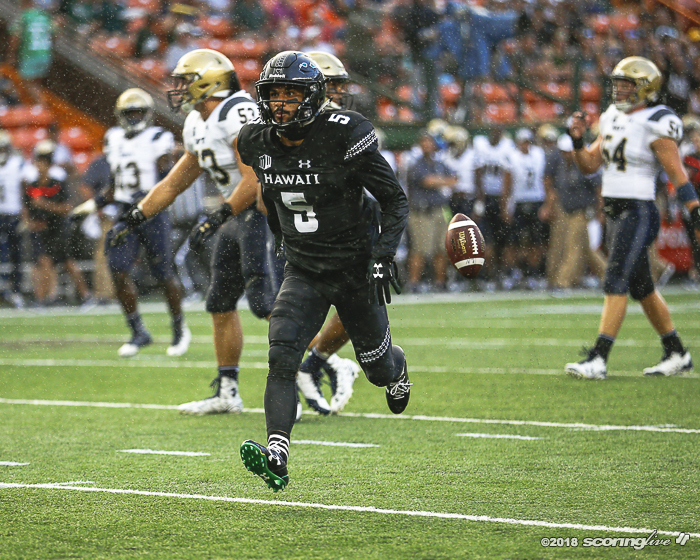 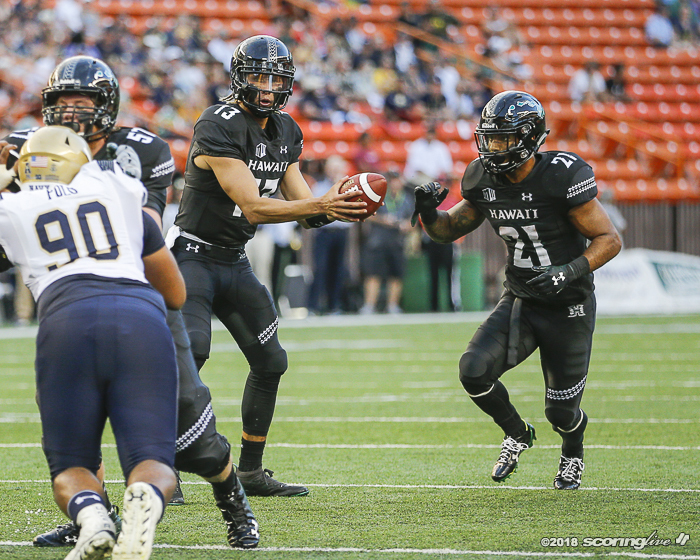 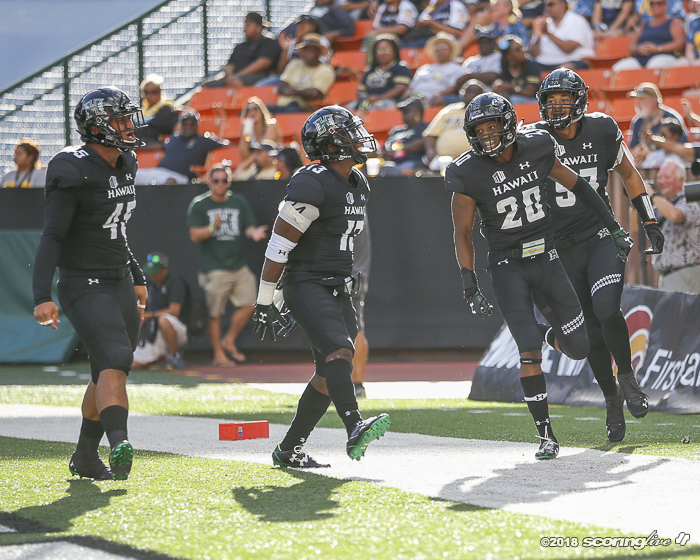 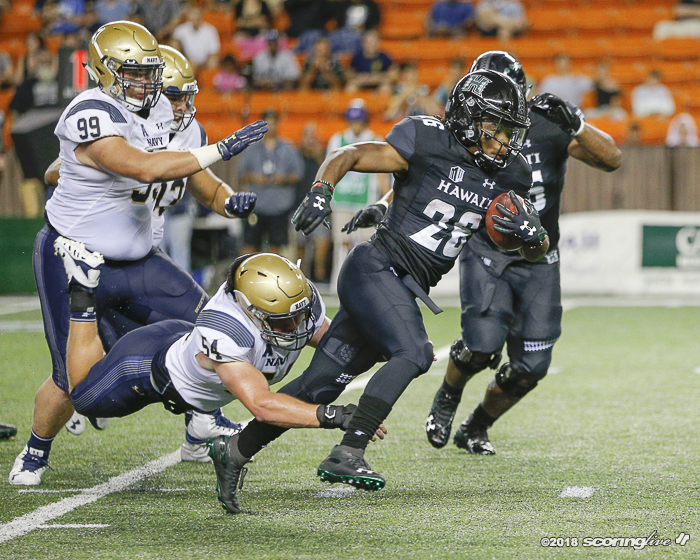 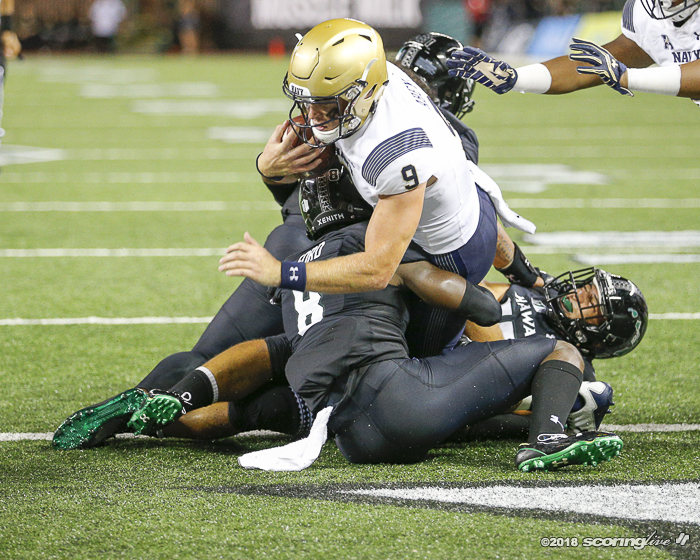 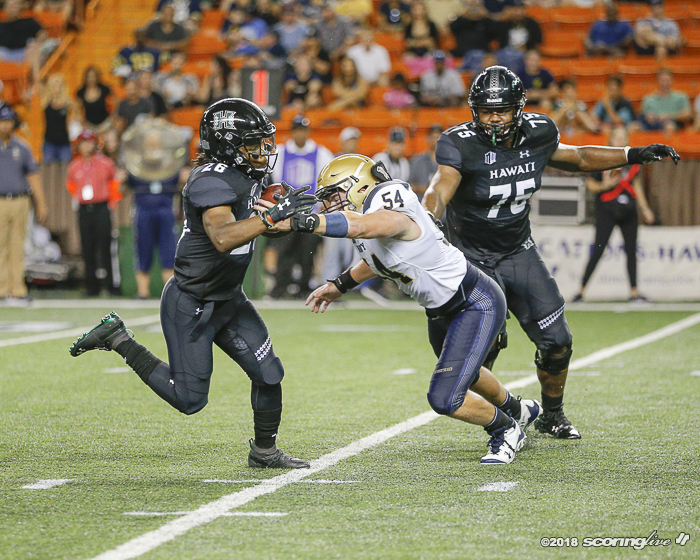 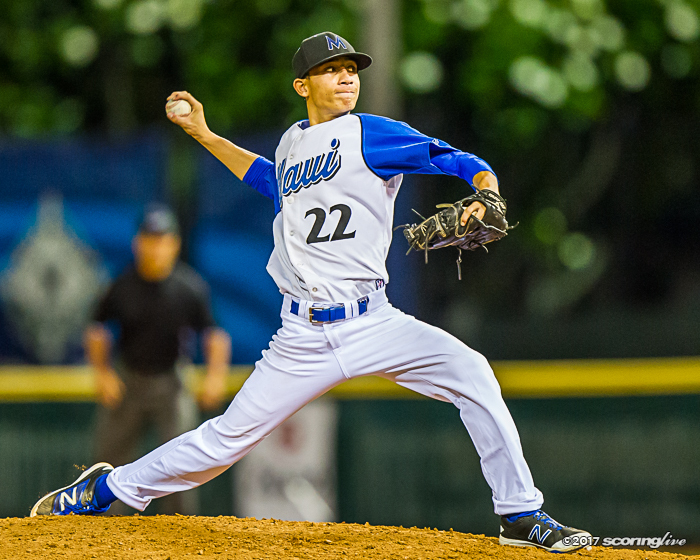 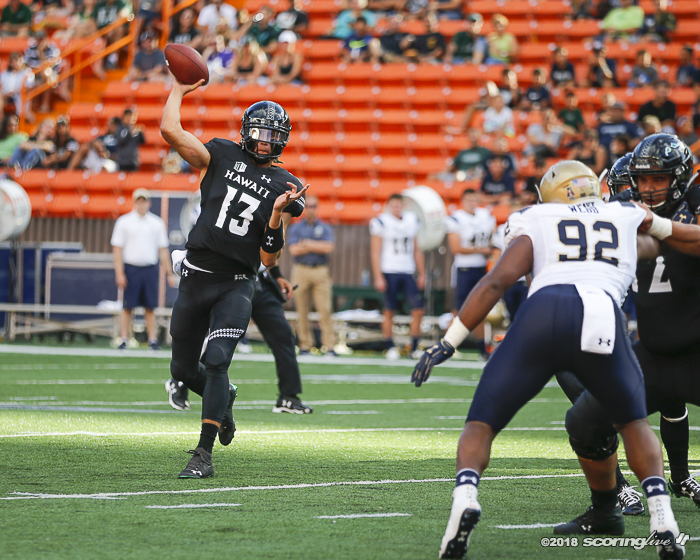 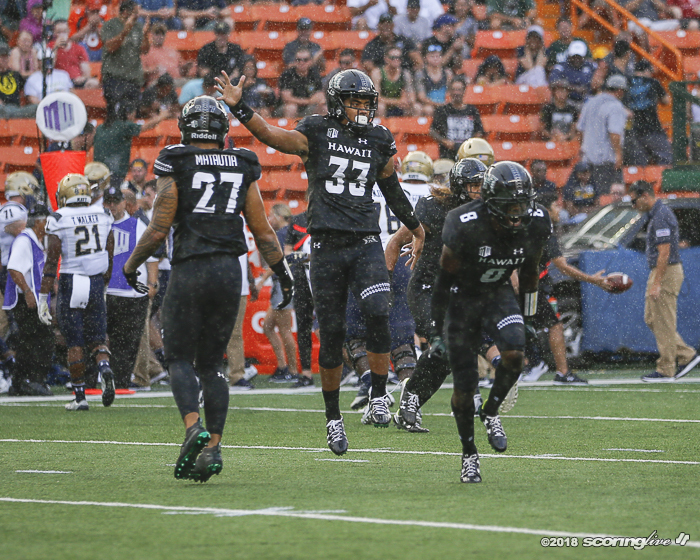 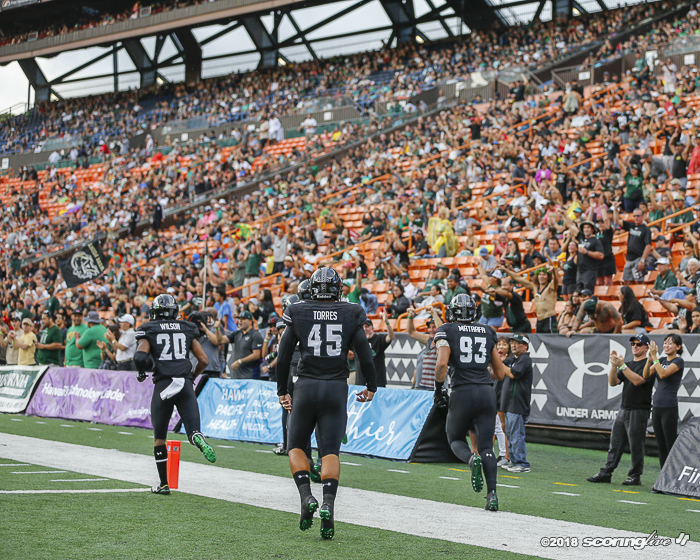 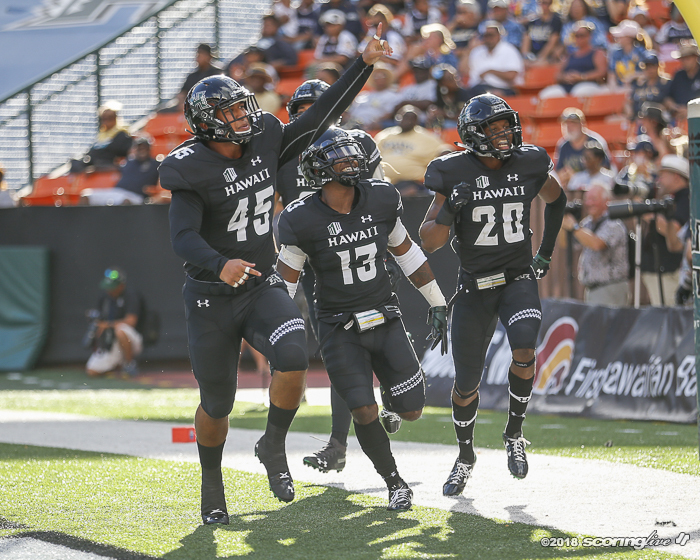 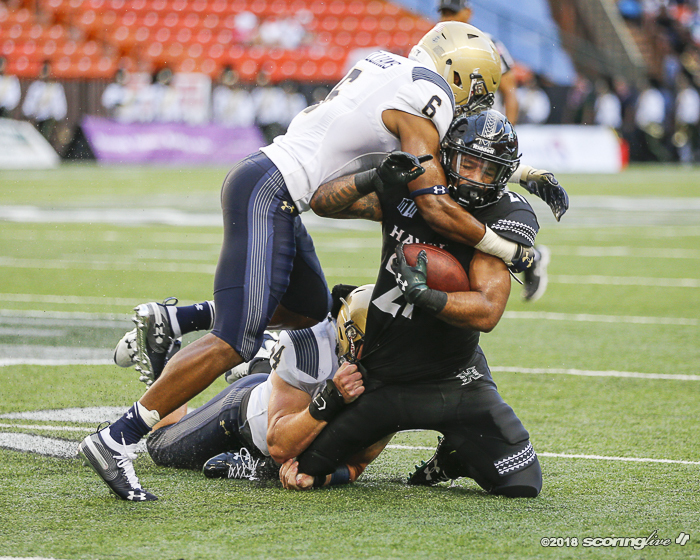 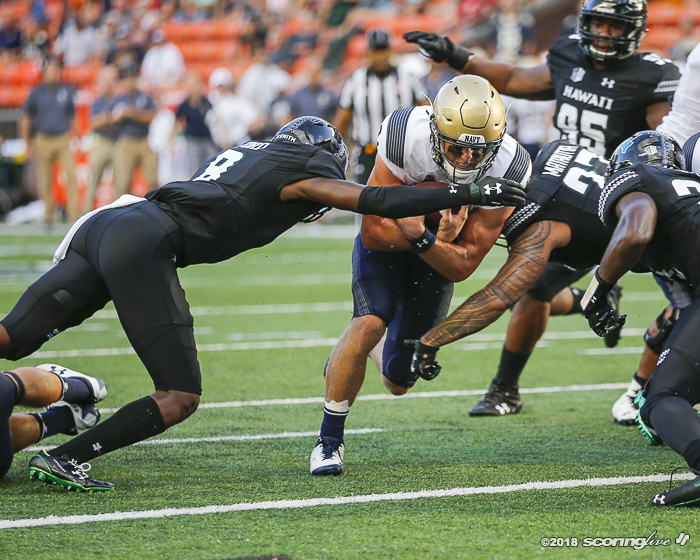 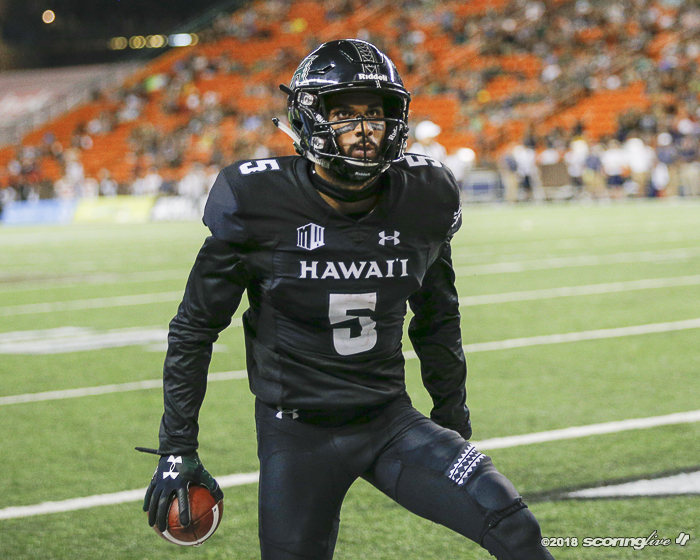 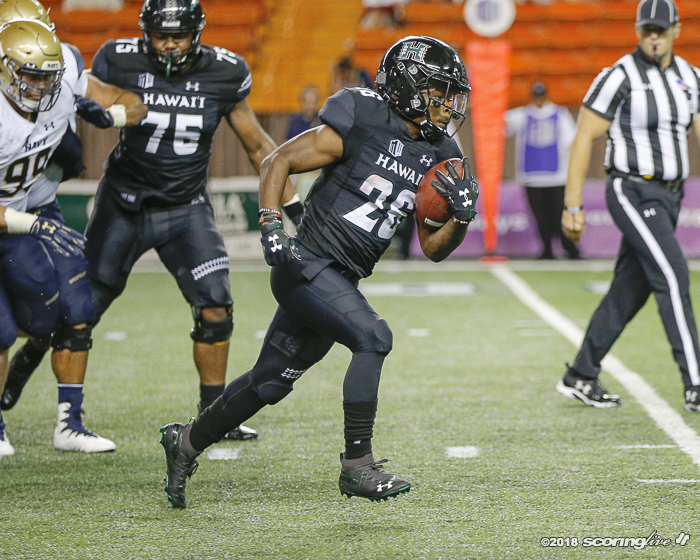 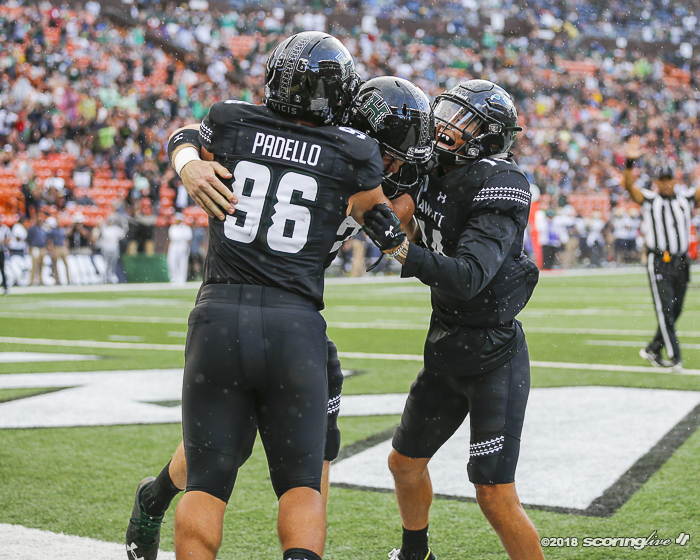 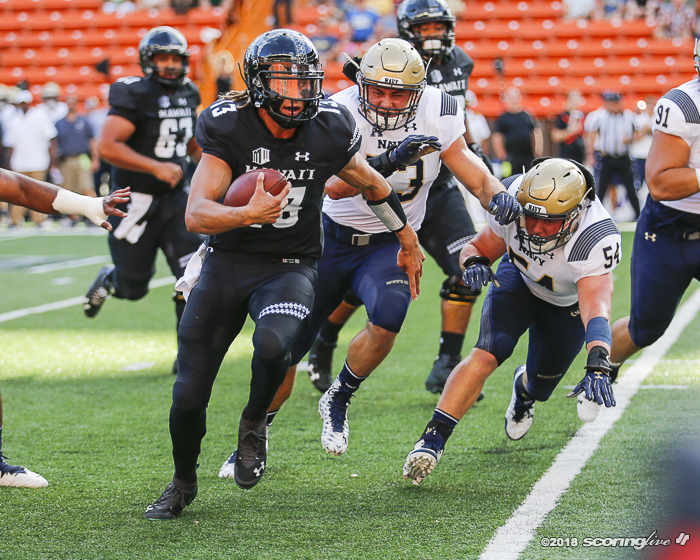 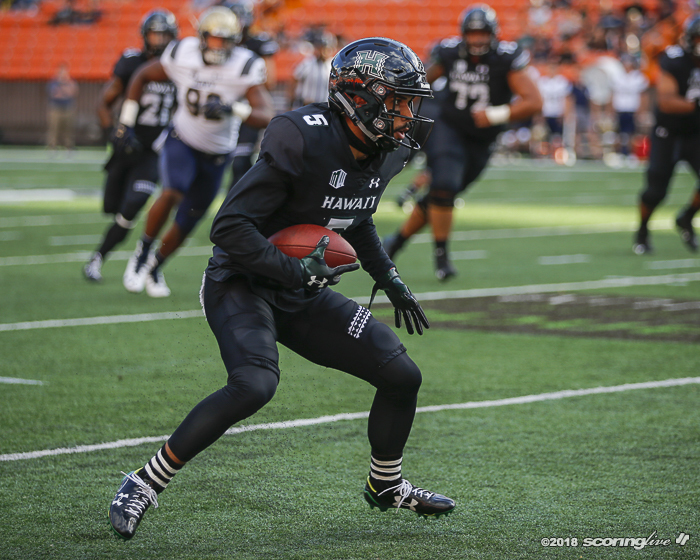 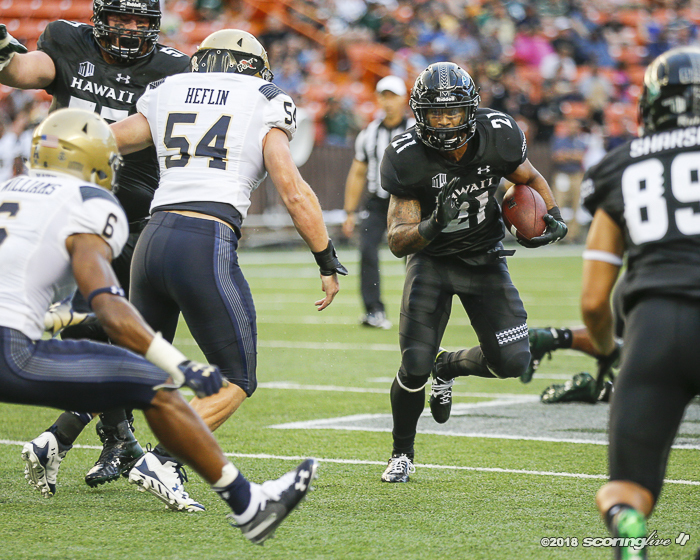 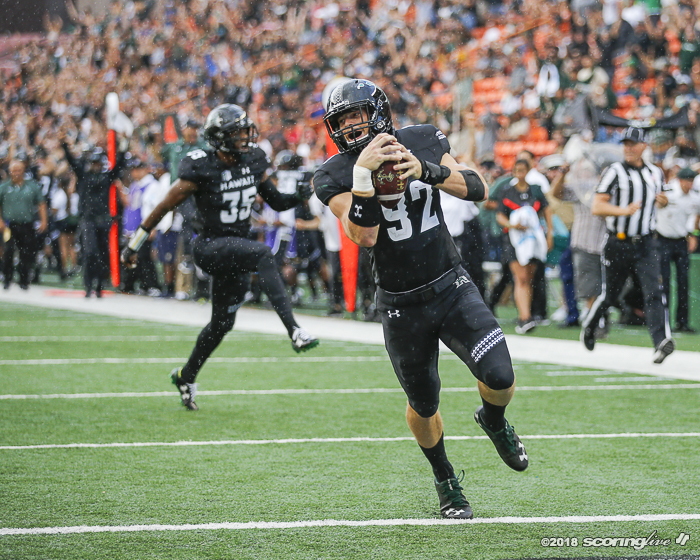 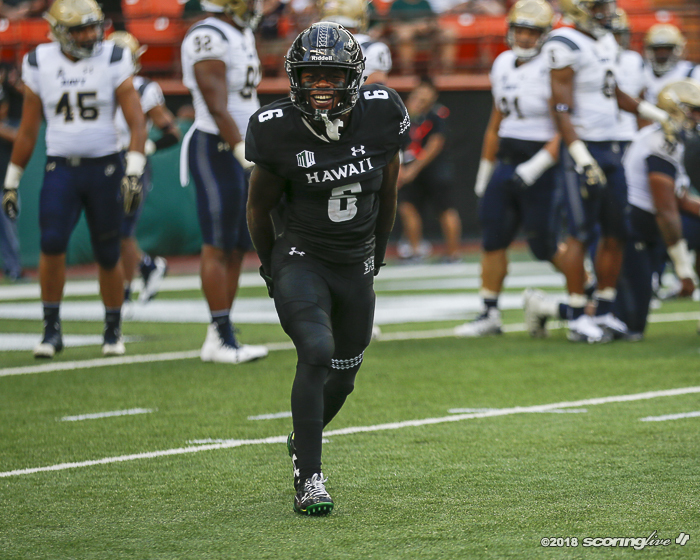 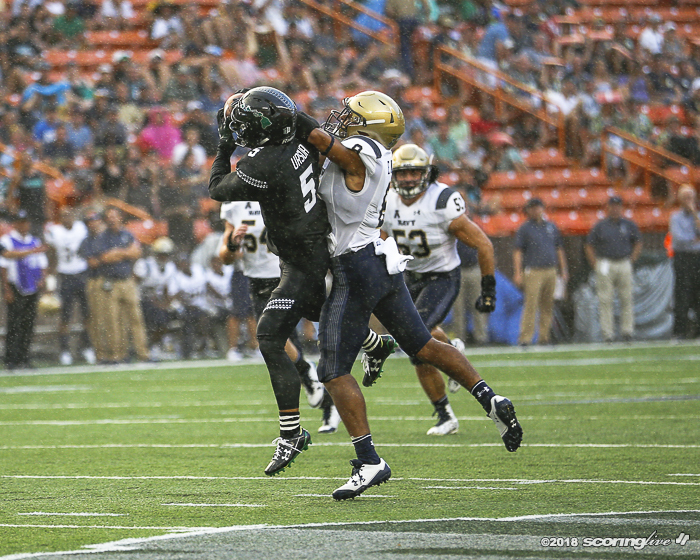 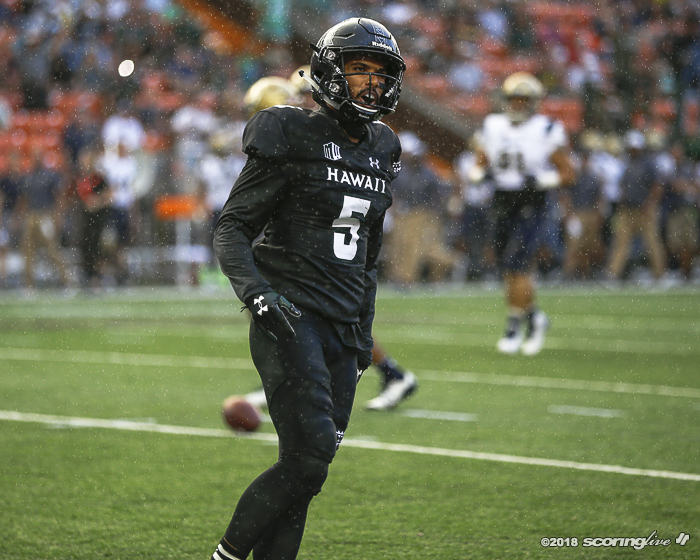 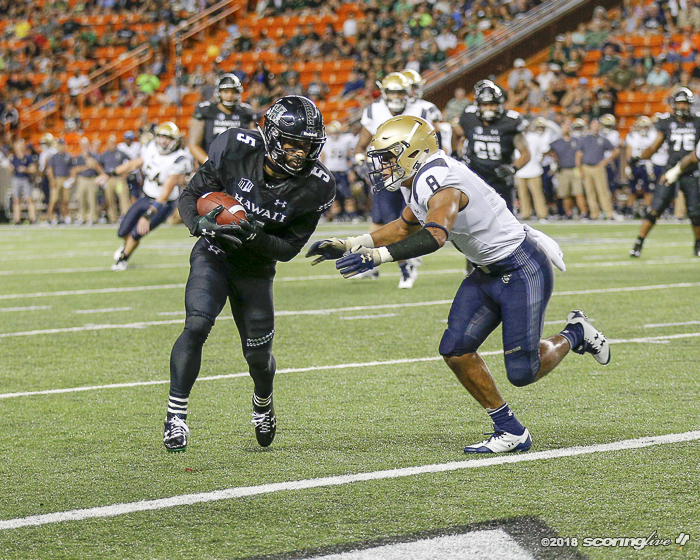 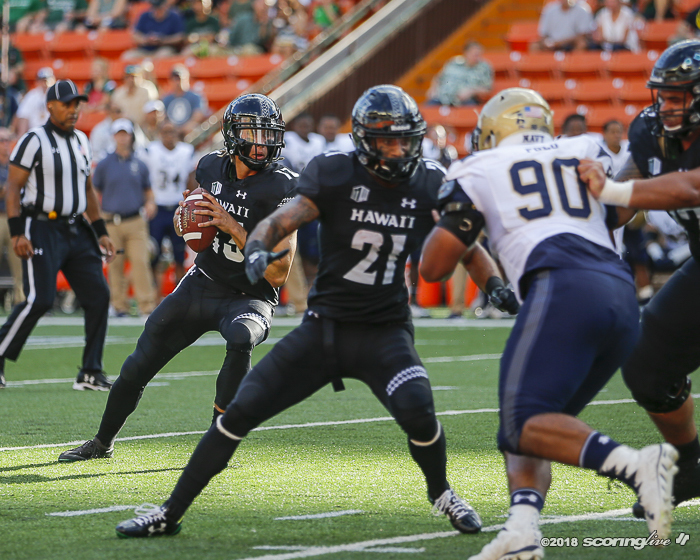 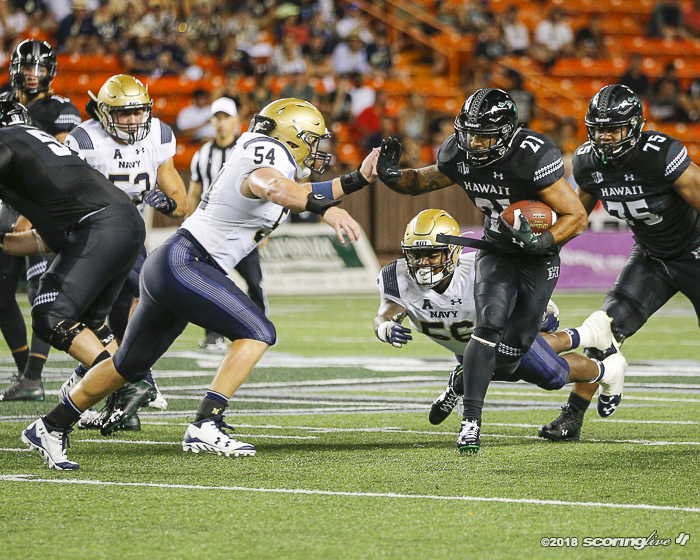 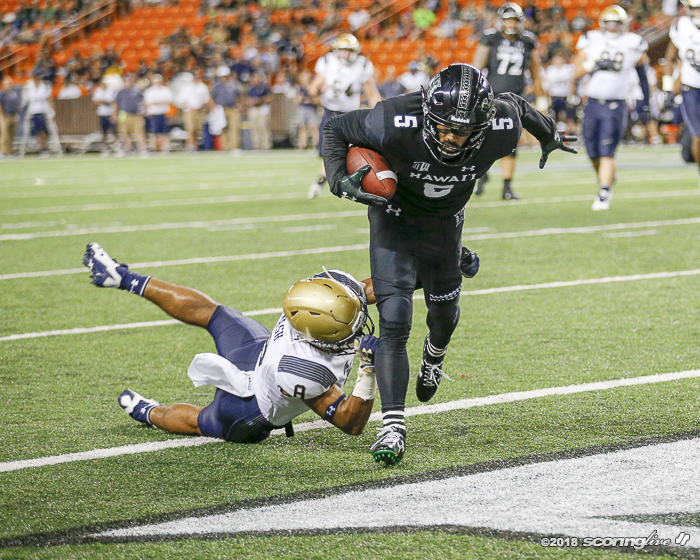 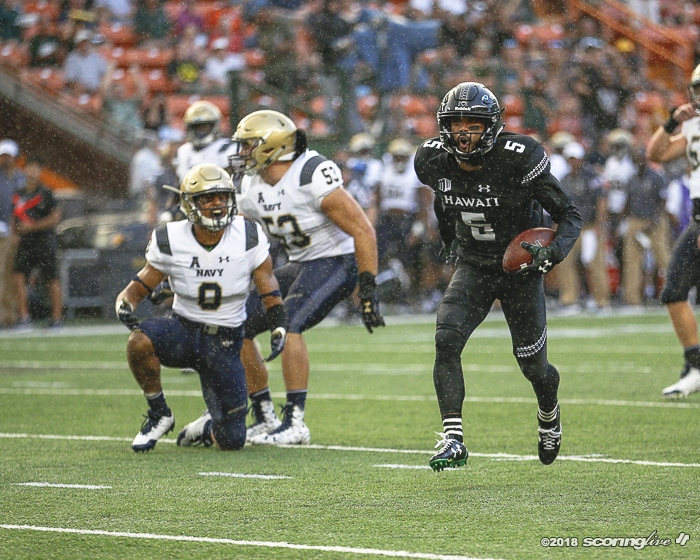 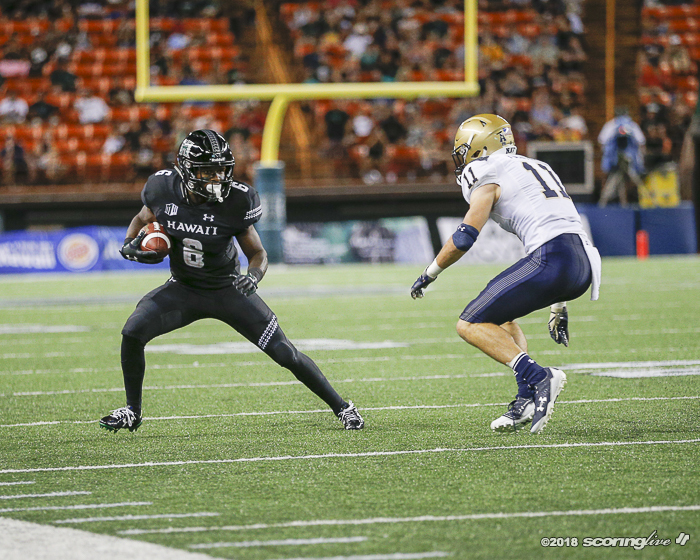 HALAWA — Cole McDonald's 428 passing yards and six touchdowns carried Hawaii to a 59-41 win over Navy before a crowd of 27,284 fans at Hawaiian Financial Credit Union Field at Aloha Stadium Saturday night. 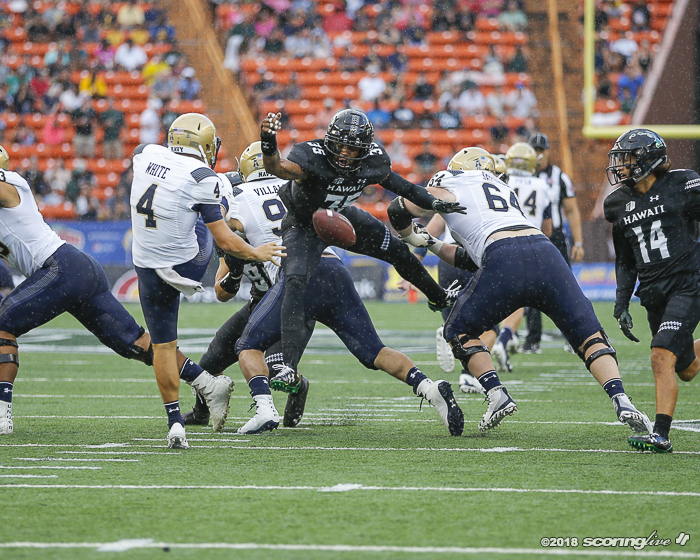 McDonald, a redshirt-sophomore quarterback, completed 30 of 41 passes without an interception. 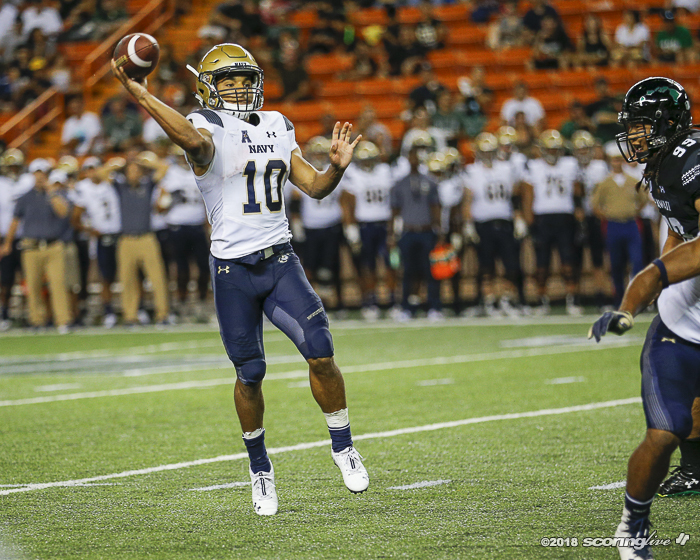 He threw two touchdown passes apiece to John Ursua (10 receptions for 167 yards), Jojo Ward (6 for 161) and Cedric Byrd (11 for 90). 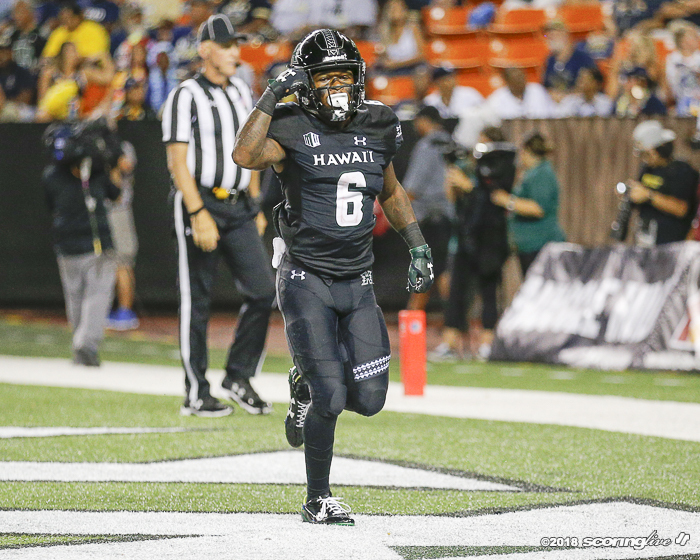 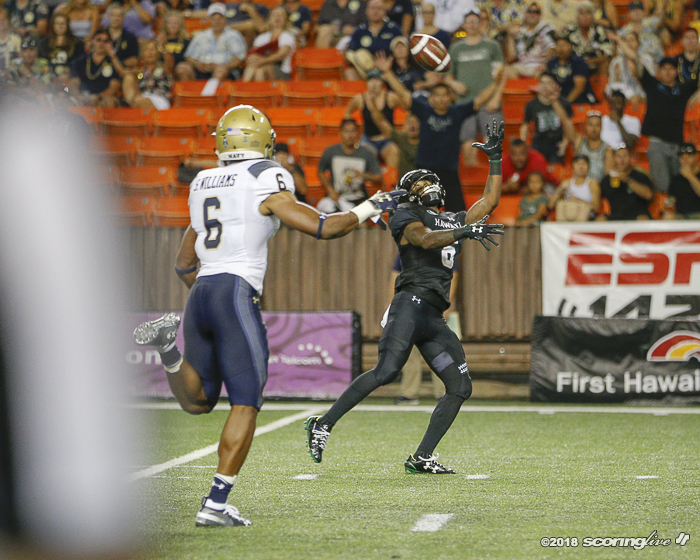 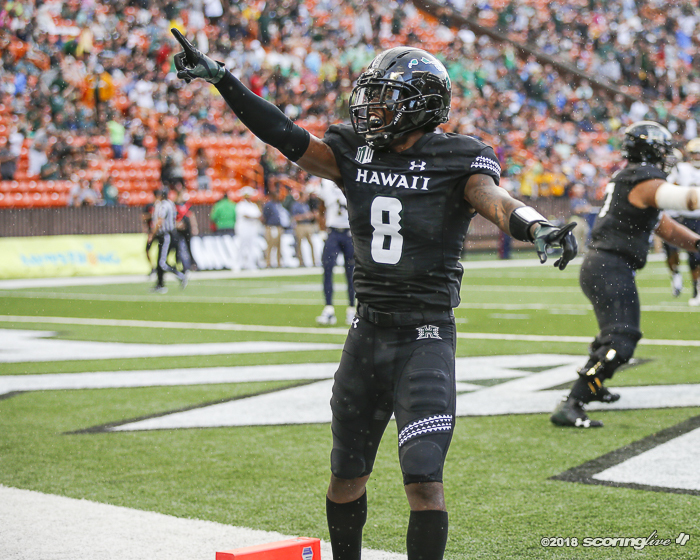 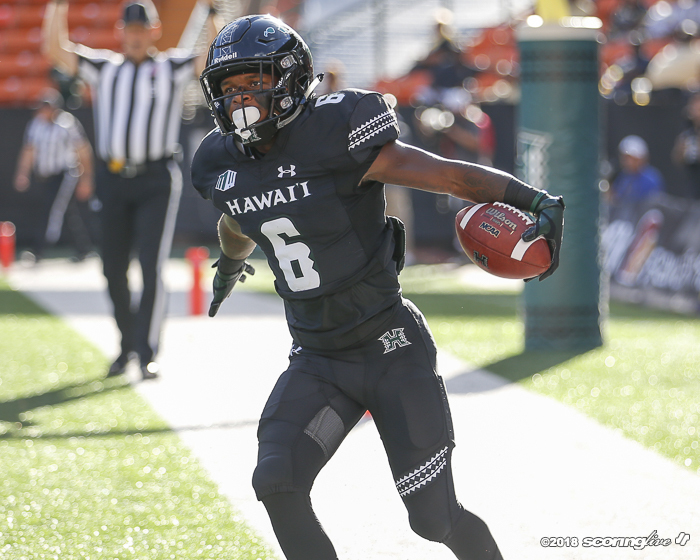 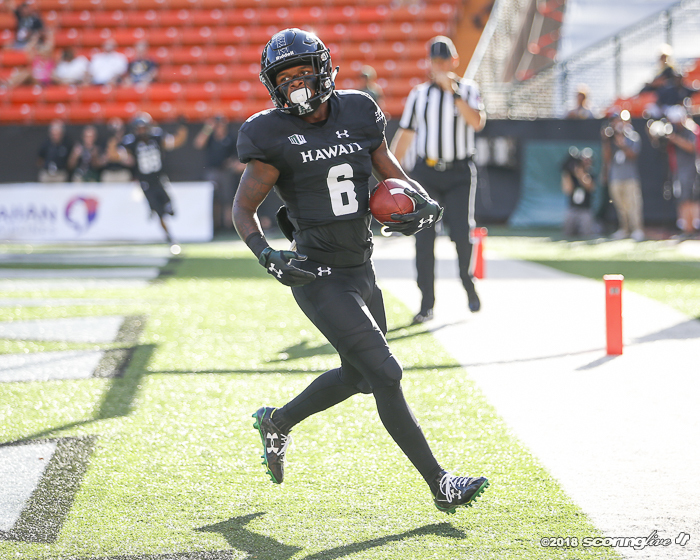 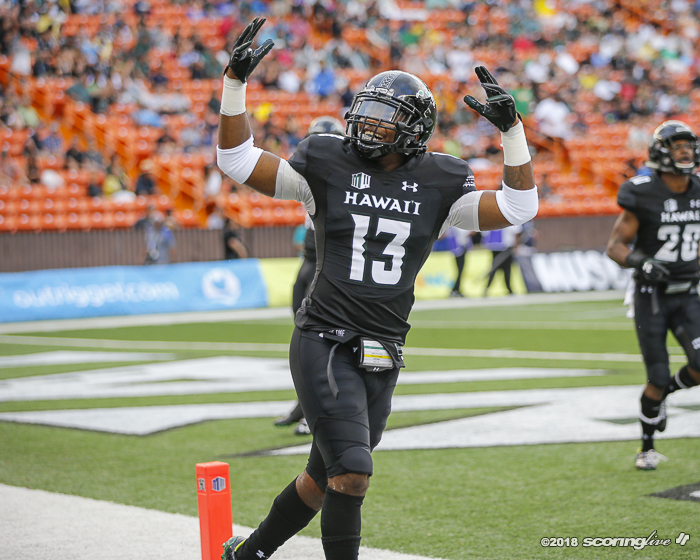 Hawaii built a 14-0 lead on McDonald's 7-yard TD pass to Byrd and a 1-yard TD run by Fred Holly III in the first quarter. 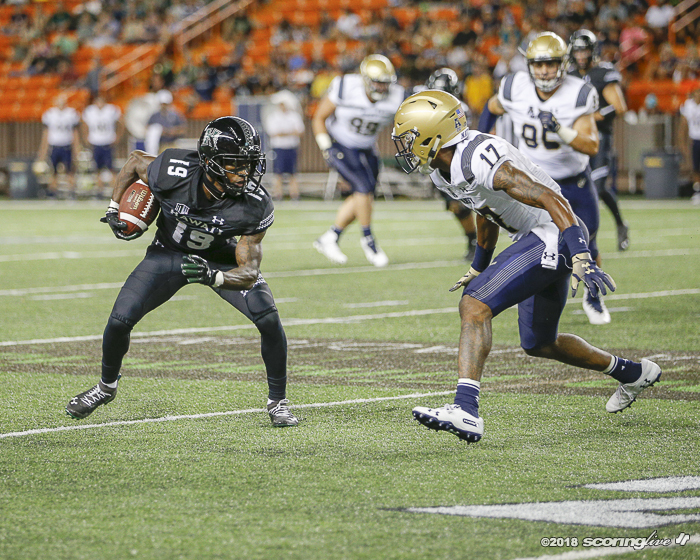 McDonald then found Ward for a 34-yard scoring strike on a fourth down early in the second quarter. 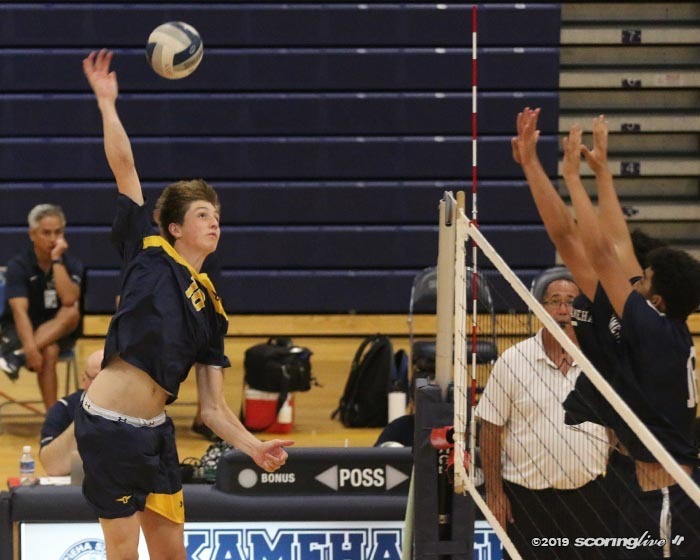 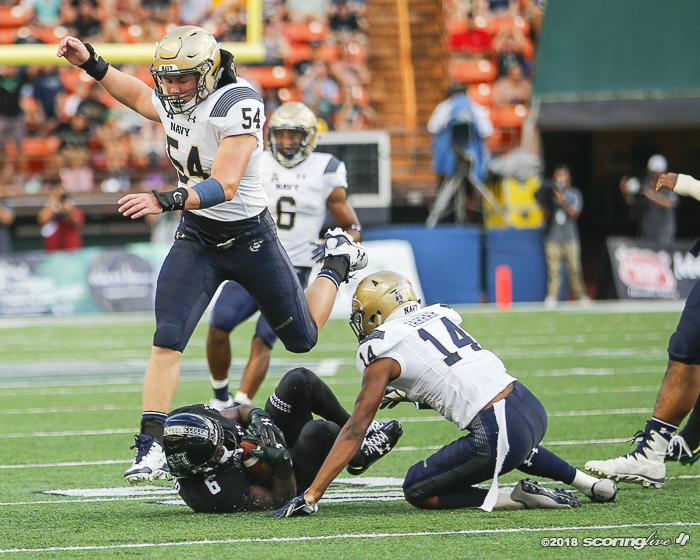 Jeffery Keene blocked a Navy punt and it was Maxwell Hendrie scooped and scored from 19 yards out. 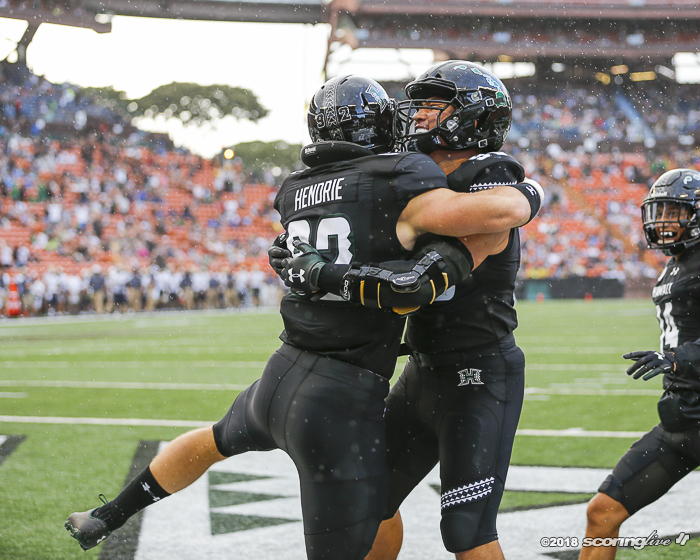 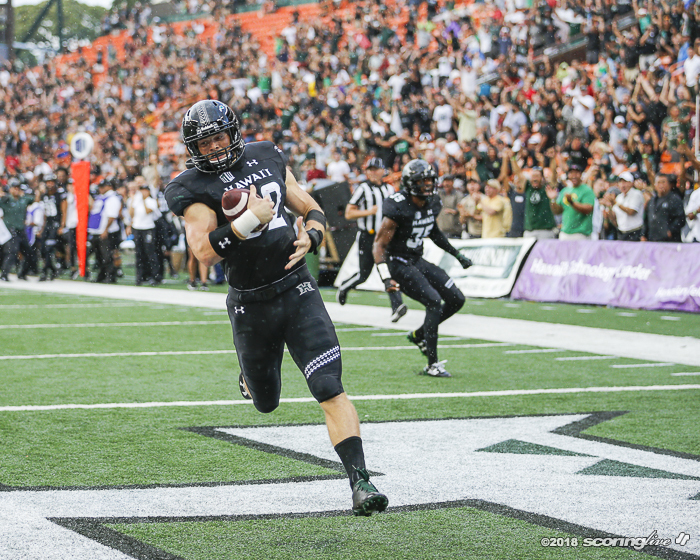 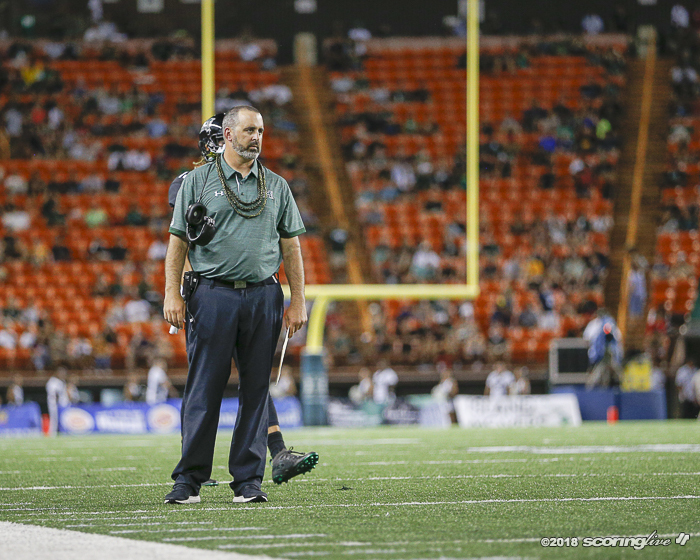 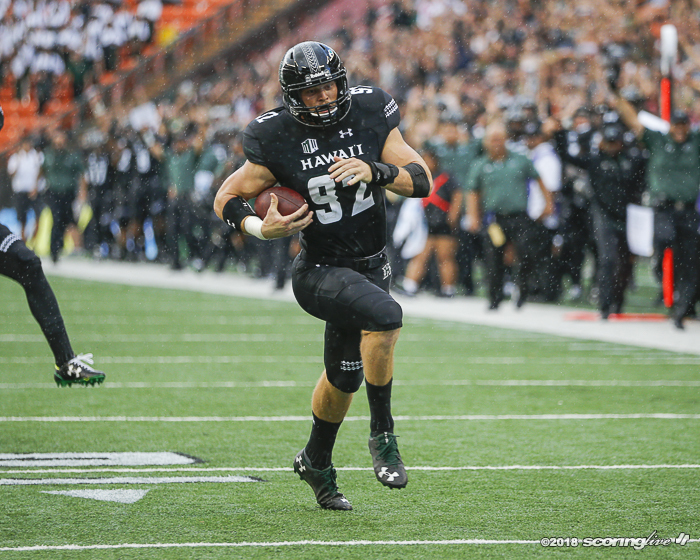 After the Ryan Meskell PAT, Hawaii took a 28-0 lead with 11:08 left in the second quarter. 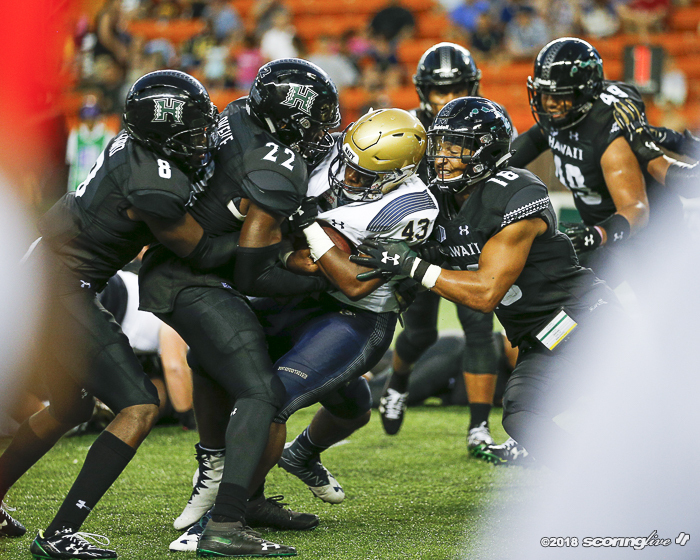 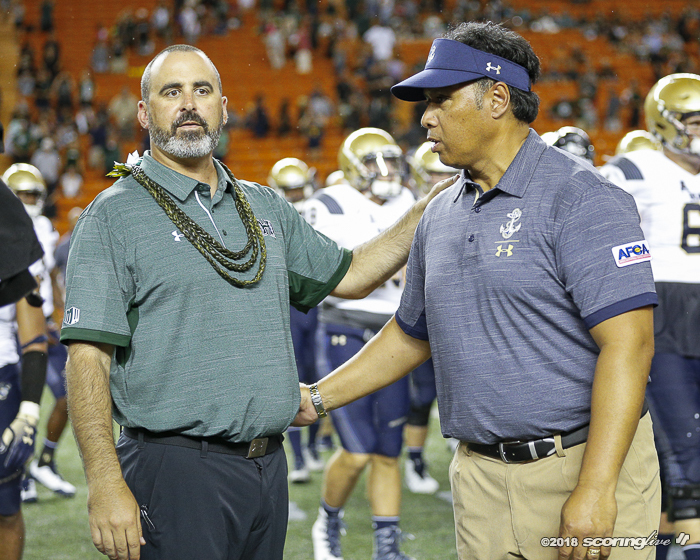 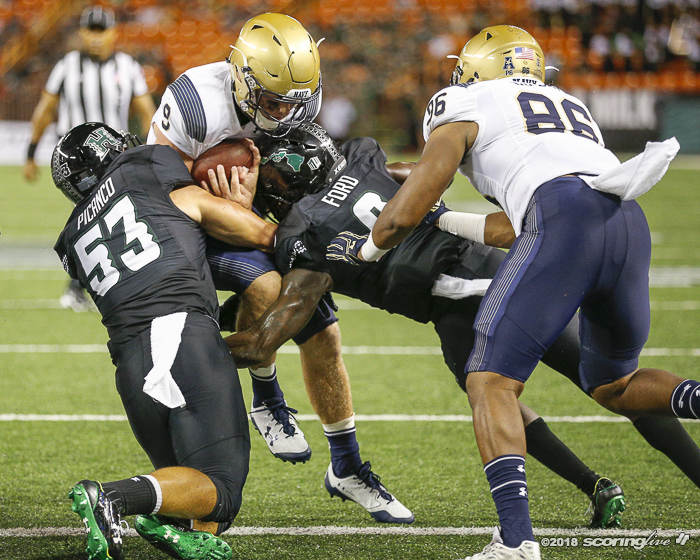 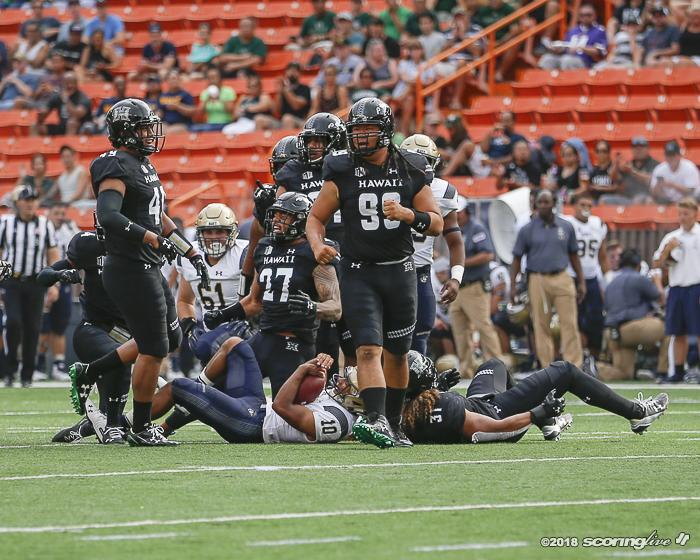 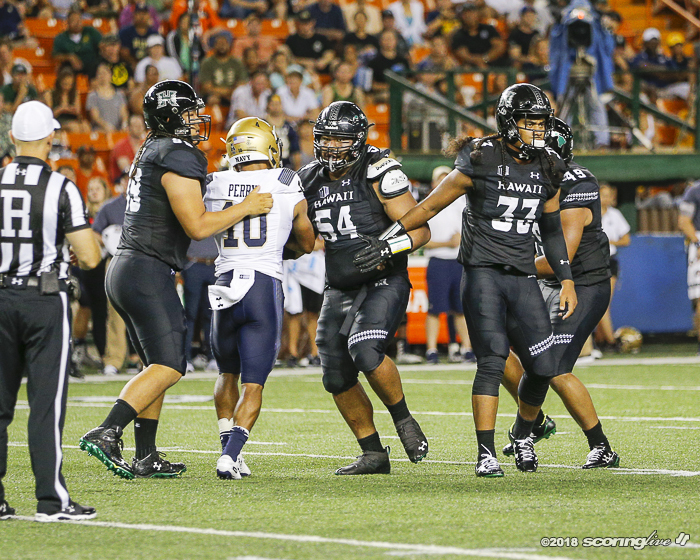 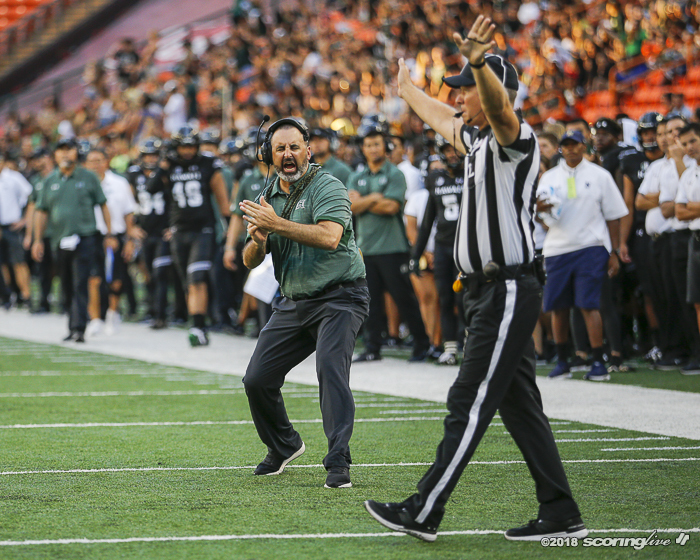 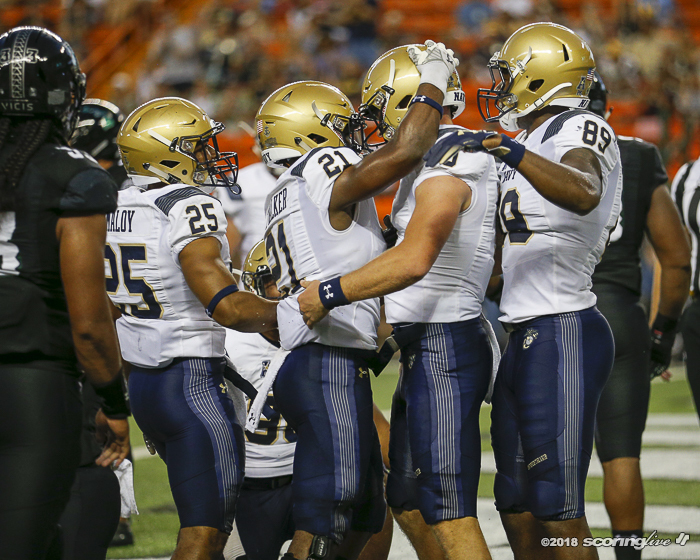 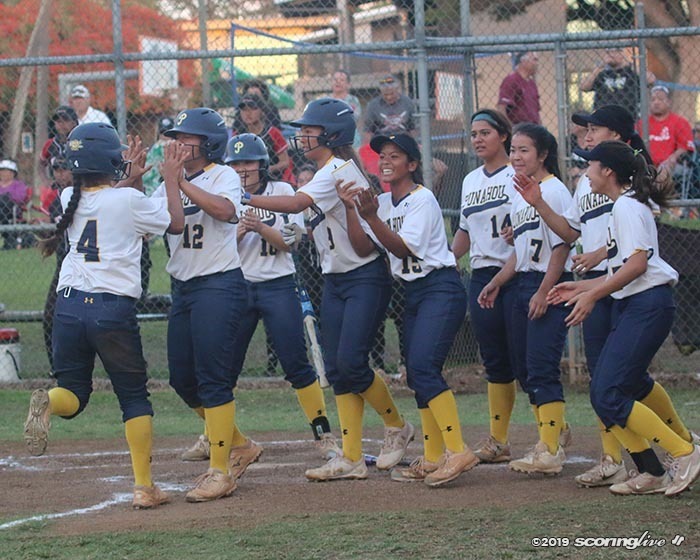 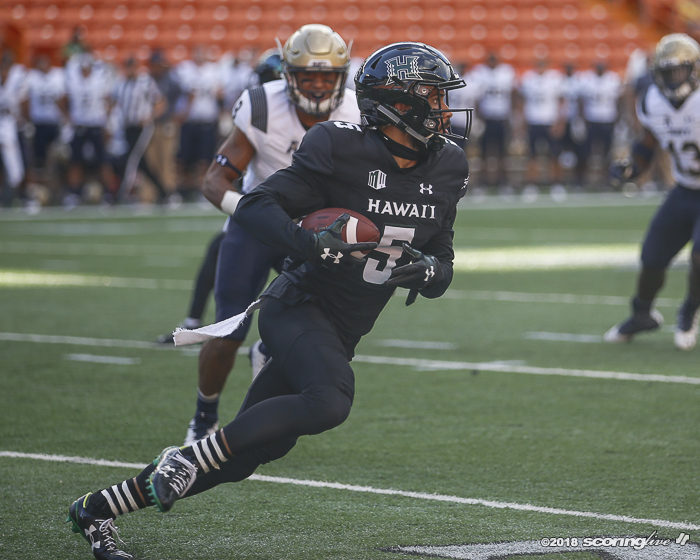 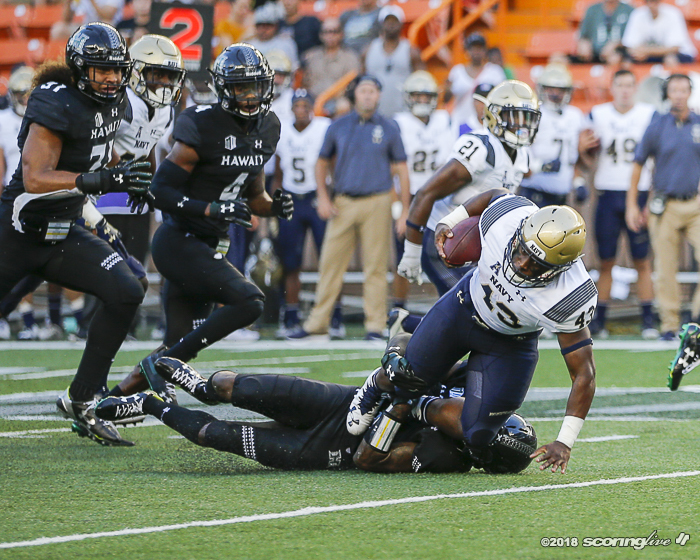 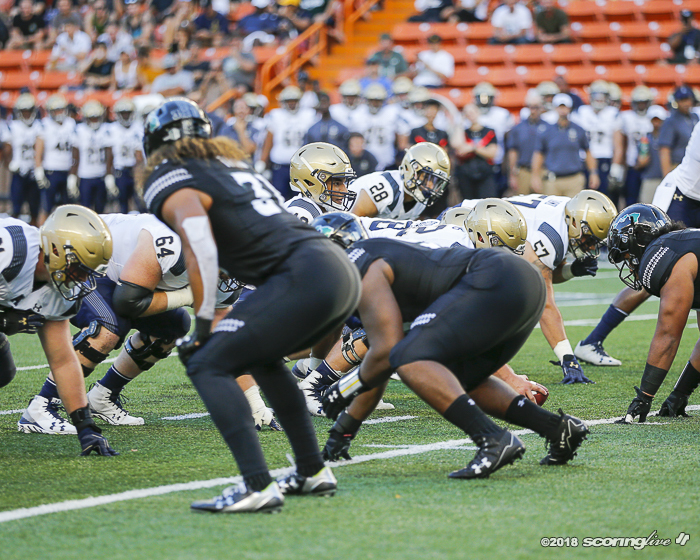 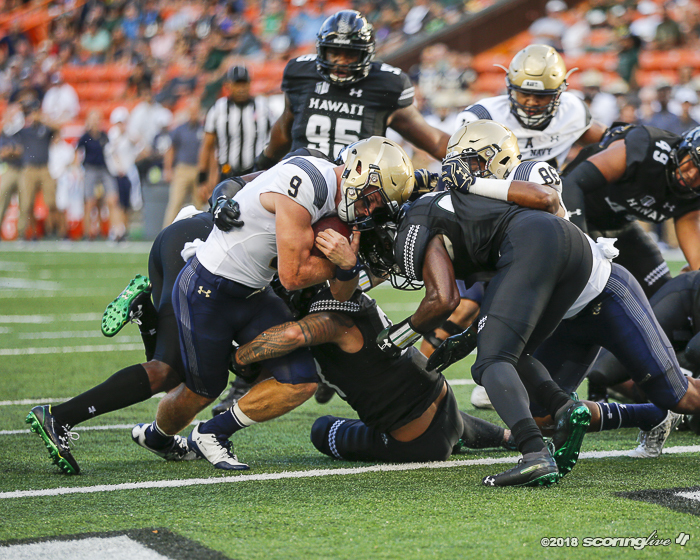 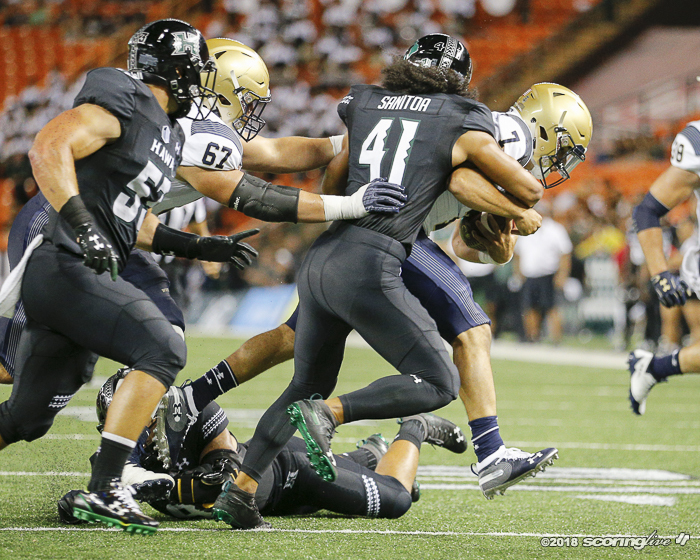 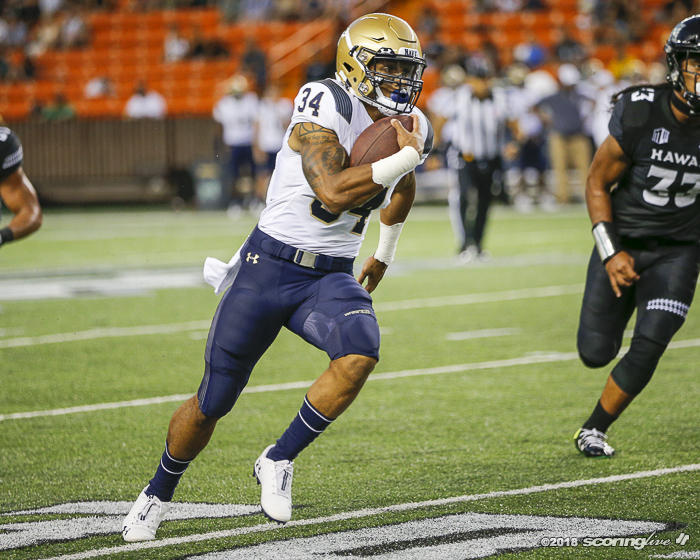 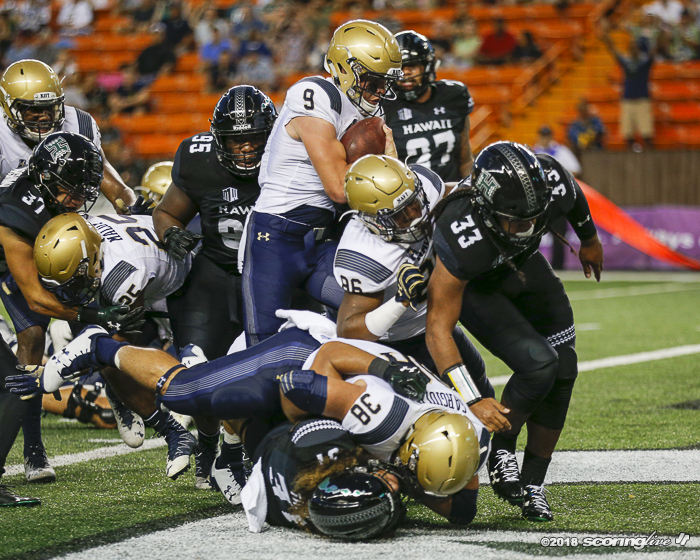 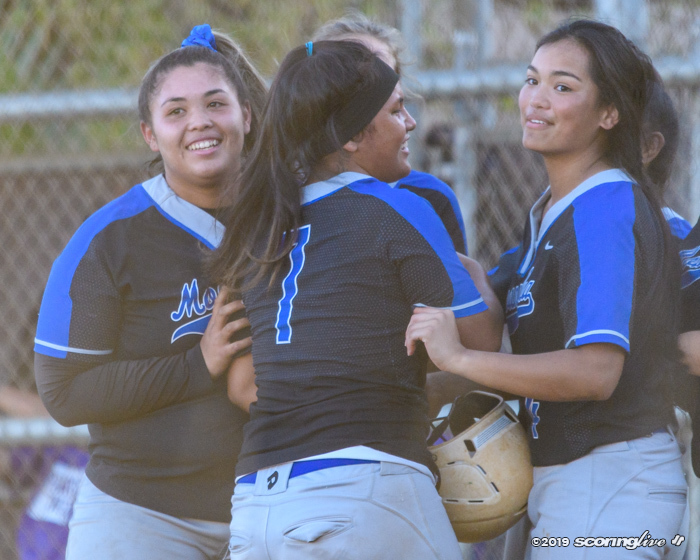 Navy got on the board with Zach Abey's 3-yard TD run, but McDonald answered with a 50-yard TD pass to Ursua on another fourth down to cap Hawaii's next drive. 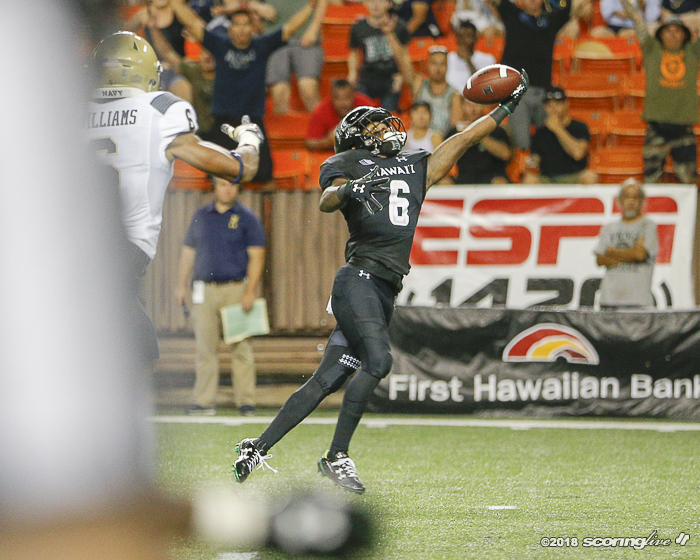 Malcolm Perry cut the lead to 35-14 with his 75-yard TD run with 4:02 left in the first half. 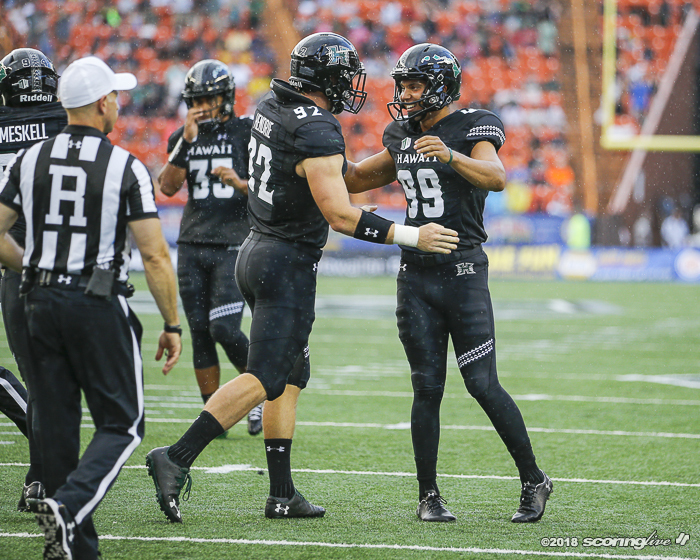 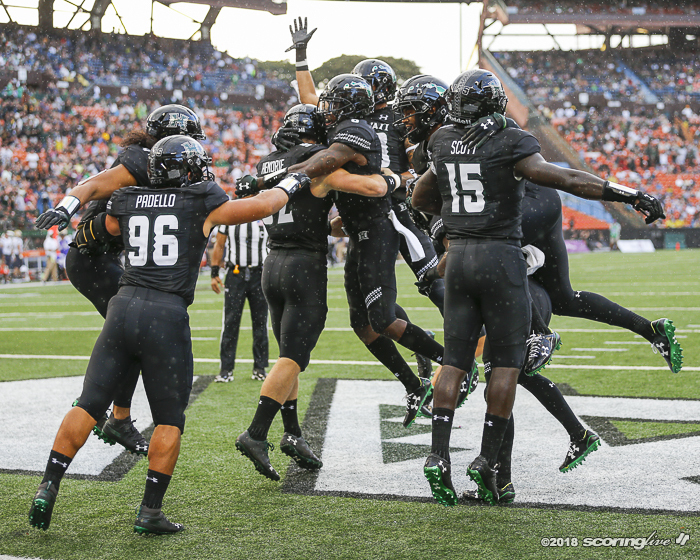 Meskell converted a 23-yard field goal on the final play of the first half to send the Rainbow Warriors into halftime with a 38-14 lead. 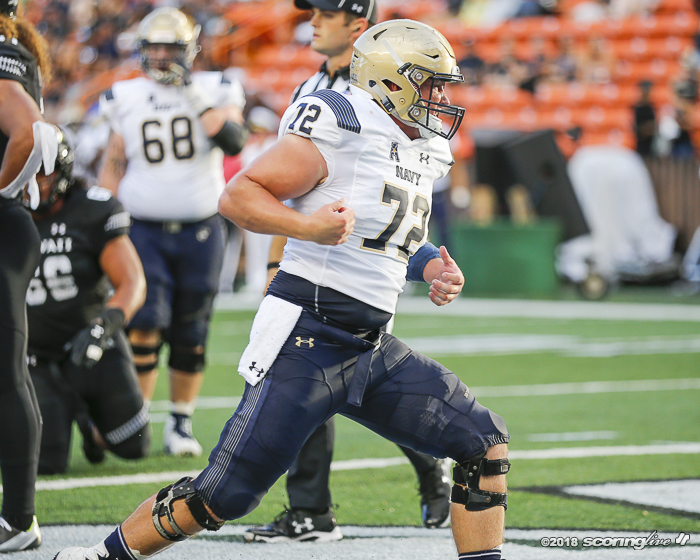 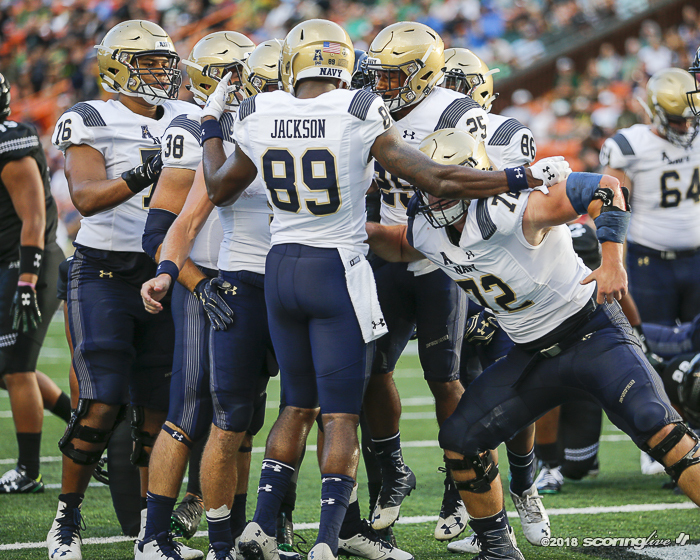 Abey found the end zone twice in the third quarter to pull the Midshipmen within 38-28. 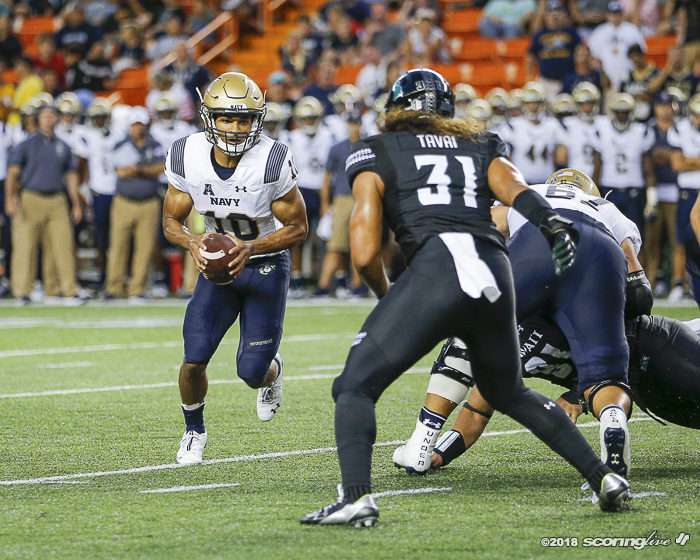 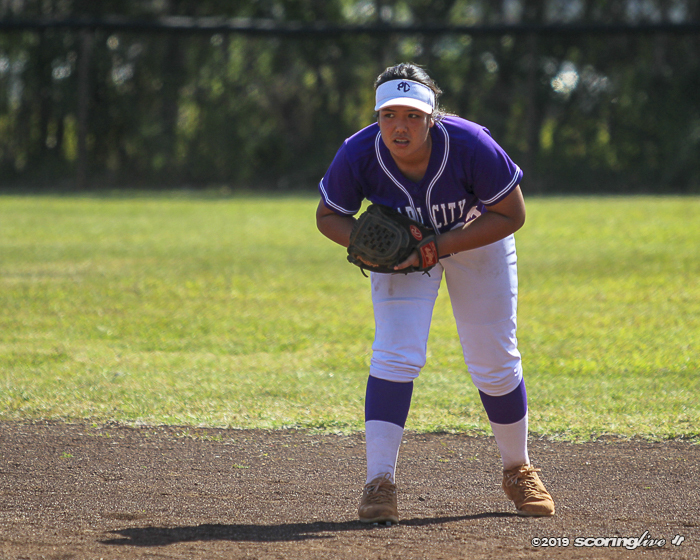 However, McDonald went on to throw TD passes of 31, 75 and 9 yards to Byrd, Ward and Ursua, respectively, in the fourth quarter. 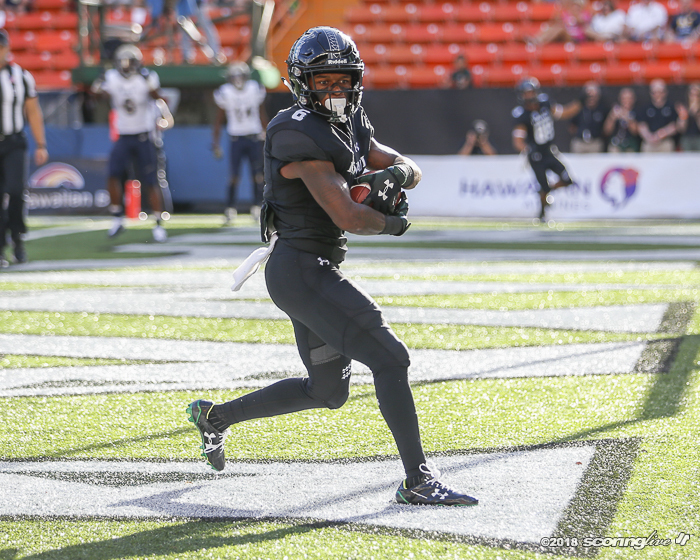 Perry, who rushed for a game-high 108 yards on 17 carries, also threw a 19-yard TD pass to Tre Walker in the fourth quarter. 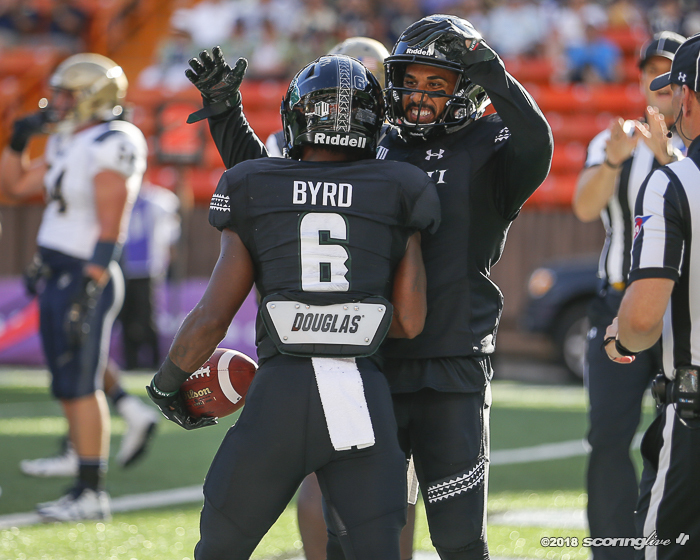 Abey's 2-yard TD run — his fourth of the game — closed out the scoring with 2:46 to play. 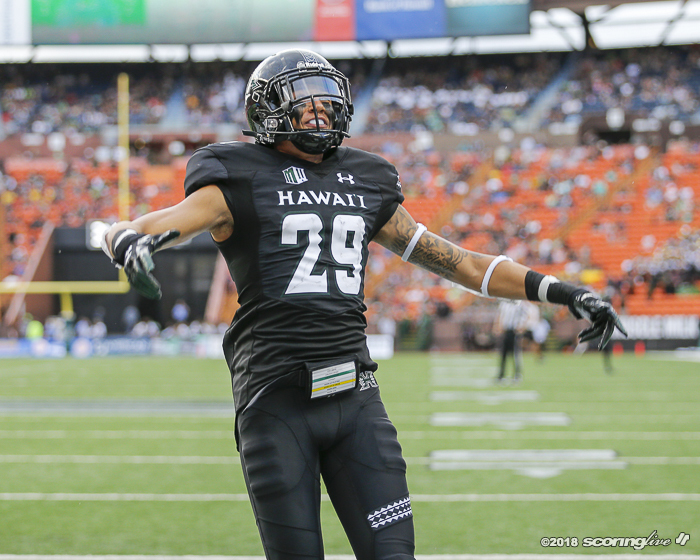 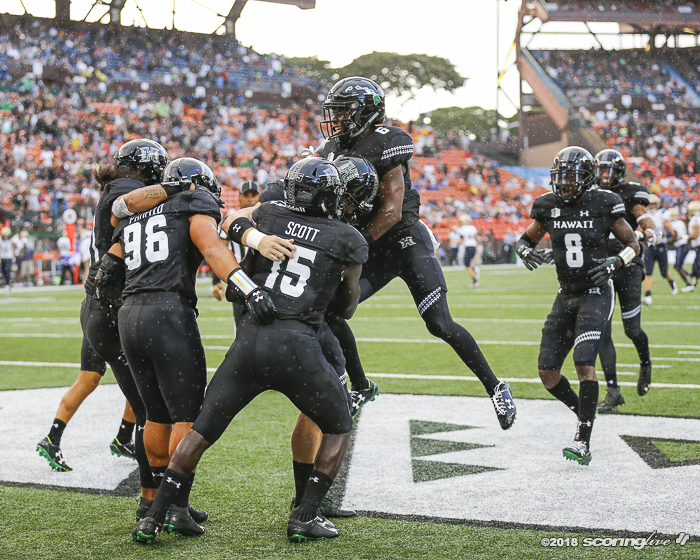 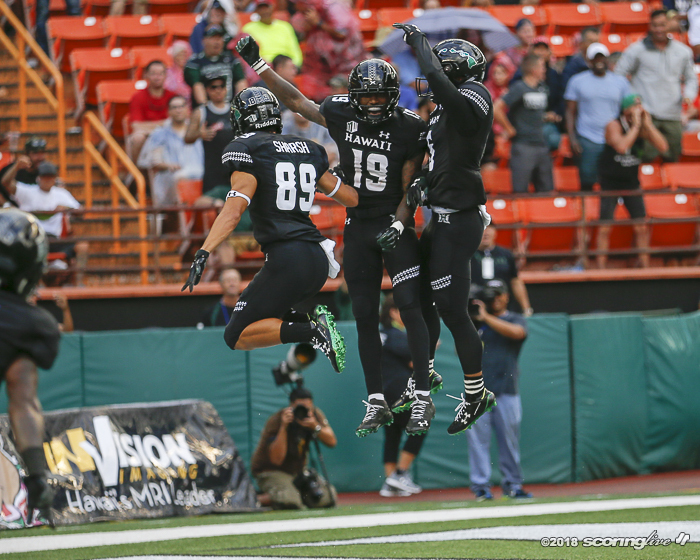 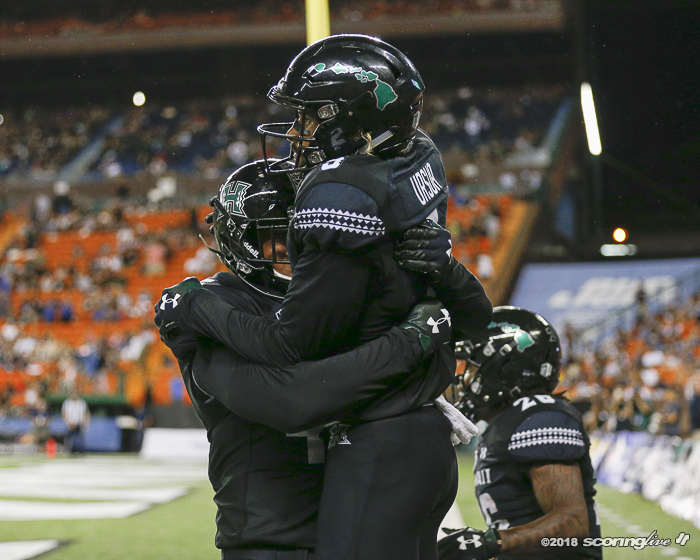 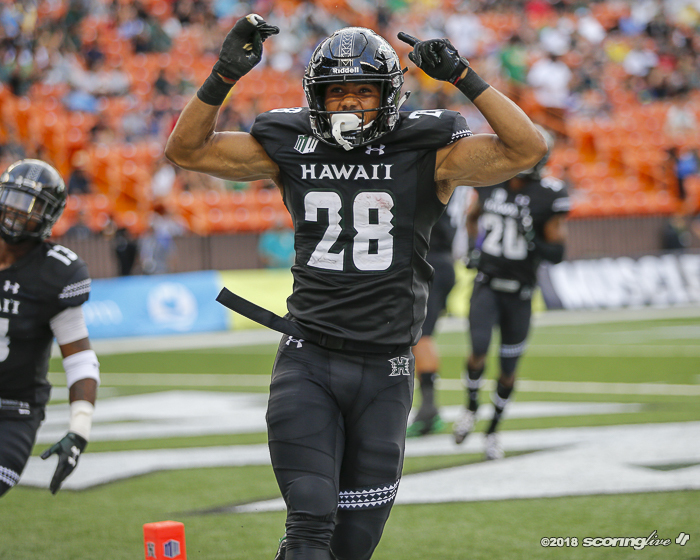 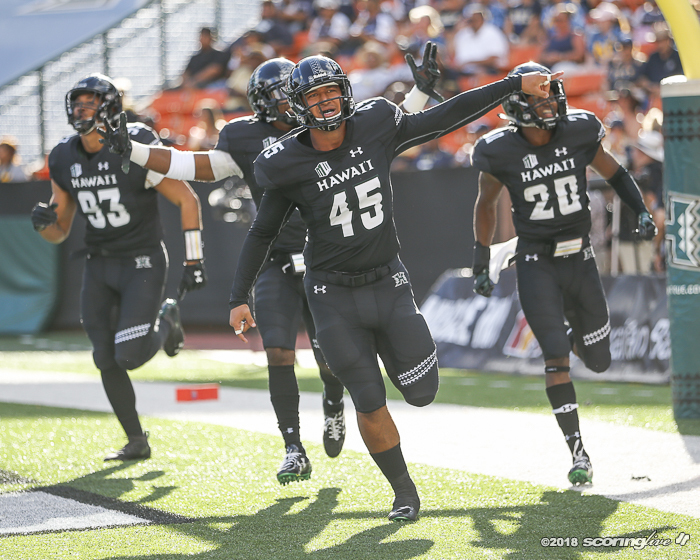 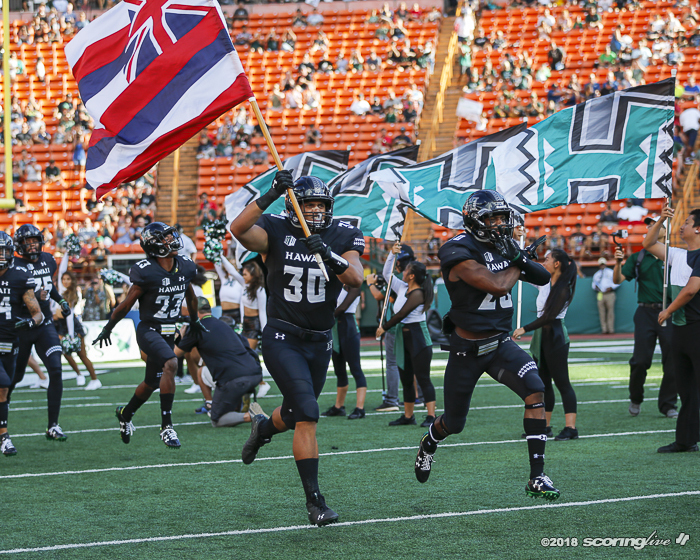 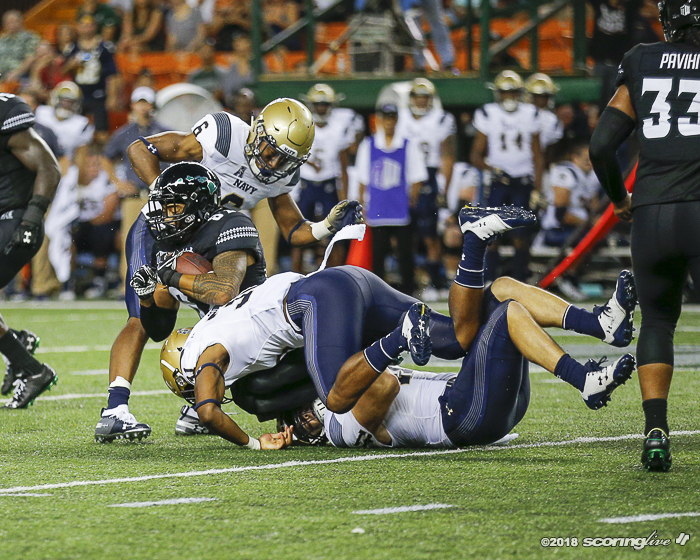 Hawaii (2-0) will host Rice Saturday. 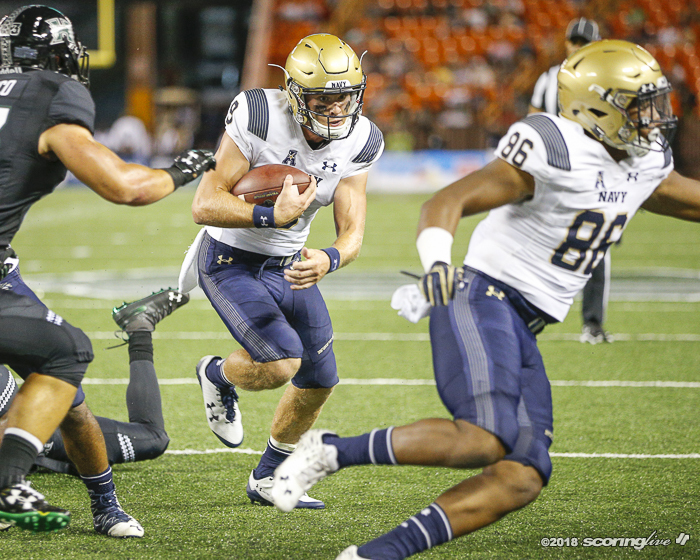 Navy (0-1) will host Memphis Saturday.